Ontario bean growers are voicing skepticism of Statistics Canada’s Aug. 31 bean production estimates. 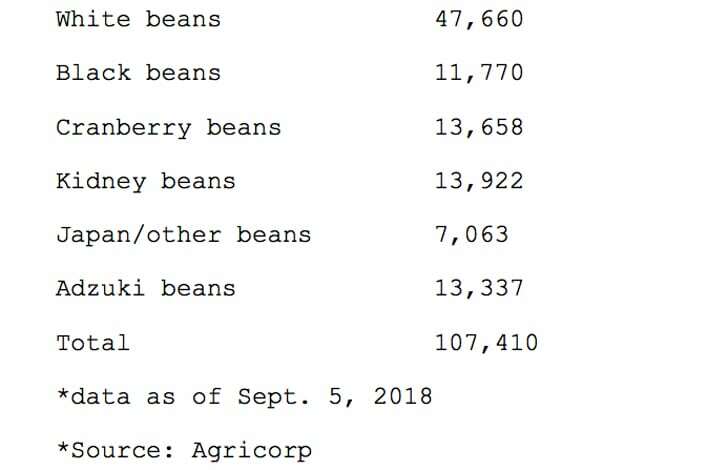 Estimates by the Ontario Bean Growers organization, suggest farmers are poised to harvest about 101,495 tonnes this year. That is 28.5 per cent more than the Statistics Canada number of 79,000 tonnes. Jim Gowland, chair of Ontario Bean Growers, said his organization reaches its estimate by looking at acres insured by provincial insurer Agricorp and then multiplying that by expected yield. Agricorp has 107,410 acres insured of all bean types this year. Ontario Bean Growers then accounts for 5,360 acres of uninsured acres. Multiplying the total of 112,772 acres by a yield estimate of 0.9 tonnes per acre, means Ontario growers should produce about 101,495 tonnes. He said the average yield estimate is “fairly conservative” given reports they are hearing. At organizational meetings two weeks ago, many grower-delegates were reporting average to slightly above average bean yields, he said. That is similar to conditions on his farm in the Teesland area. However, he added overall provincial bean numbers will be down from last year’s 120,900 tonnes, mostly due to fewer seeded acres, but it won’t be as low as the Statistics Canada estimate. In fact, insured acres have already exceeded the planted acreage estimates of 76,300 acres Statistics Canada gathered data for this spring. In Manitoba, Statistics Canada also projected edible bean production to decline. It estimated total production of 122,800 tonnes, which compares to 130,400 tonnes a year ago. Overall provincial yields, he said, could reach about 2,000 pounds per acre for all bean types. However, he said the crop is highly variable from field to field. Some growers may see only 1,200 lb. per acre, while farmers in areas that received timely rain could see yields of 2,600 lb. per acre. The Statistics Canada report for estimated production of principal field crops is based on data from a farmer survey in July.